*GREAT PRICE! * HIGHLY Rated Juicer Juice Extractor, Aicook 3” Wide Mouth Stainless Steel Centrifugal Juicer, BPA-Free, Non-Slip Feet, Three Speed Juicer Machine for Fruits and Vegetable just $34.49 after the Code (reg $49.99) + FREE Shipipng! 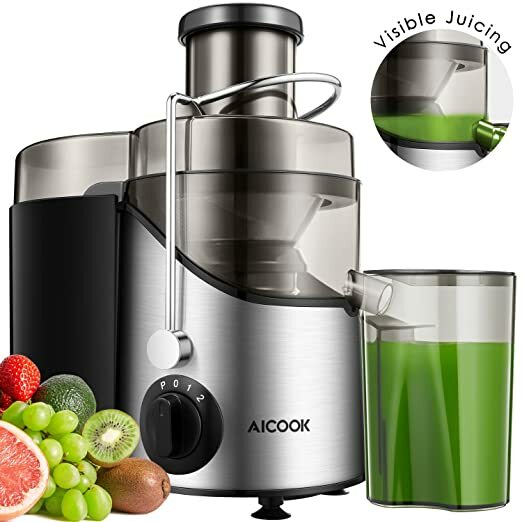 Amazon is offering this HIGHLY Rated Juicer Juice Extractor, Aicook 3” Wide Mouth Stainless Steel Centrifugal Juicer, BPA-Free, Non-Slip Feet, Three Speed Juicer Machine for Fruits and Vegetable for $49.99 – $15.50 with promo code I9HYHZPS = just $34.49 with FREE Shipping! PERFECT 5 out of 5 stars with $21 customer reviews!! You can buy multiple juicers at the discounted price in the SAME transaction! ✔ Healthy and Delicious Juice – Extracts up to 26% more juice and 36% more vitamins and minerals than other juicers. All materials that come in contact with food are FDA & BPA-free. Only a few seconds, you can drink a cup of juice without pulp and foam. Nourish your life. ✔ 3” Wide Feed Chute Design & Easy Cleaning – Fit whole fruits & vegetables, without slicing and chopping, completely liberate your hands, reducing prep time to get the delicious juice. Except for the motor base, all parts are dishwasher safe. Simplify your life. ✔ Three-speed Modes for Fruit and Vegetable – “P” to fastest speed, “I” low speed, “II” fast speed. 3 speed control maximizes juice yield from soft, leafy greens and hard fruits, you may use the low speed for softer fruits and vegetables or the higher speed for those harder ones. ✔ Safety Locking Arm & Non-slip Rubber Feet – Prevent the juicer from operating without the cover locked into place. Overload protection prevents over-heating, automatically shutting the machine down when it senses that the machine is overloaded. Equipped with Non-slip Rubber Feet at the bottom of the juicer, allows you to use the juicer safer and more stable than other juicers.